I've been told that you know a good hair dresser when you see one whose roots need a touchup. They are so busy with clientele that they don't even have time to do their own. I'd like to think the same can be said for designers...or at least ones who haven't hit the motherload yet. If I had tens of thousands of dollars coming in every month, I could just hire someone to finish the areas of my house I'm not finished with yet. But alas, I don't. Which may or may not mean I have paint swatches on the wall in two rooms of my home for months. Confession: I've had paint swatches on my master bathroom walls for over a YEAR. Cue the gasp. I'd like to blame part of that on finding out I was with child a week after those swatches went up. BUT now my baby is 8 months old. I must find time to get to it. Even if that means dropping the Little off at the in-laws for a few hours so momma can paint with no interruptions. And I'm thinking next week might be the prime time. The current walls have a beige base with a moss green faux finish on top. I'm not saying all faux finished walls are a bad idea, but most "Hey, I could totally sponge paint that wall!" moments are. 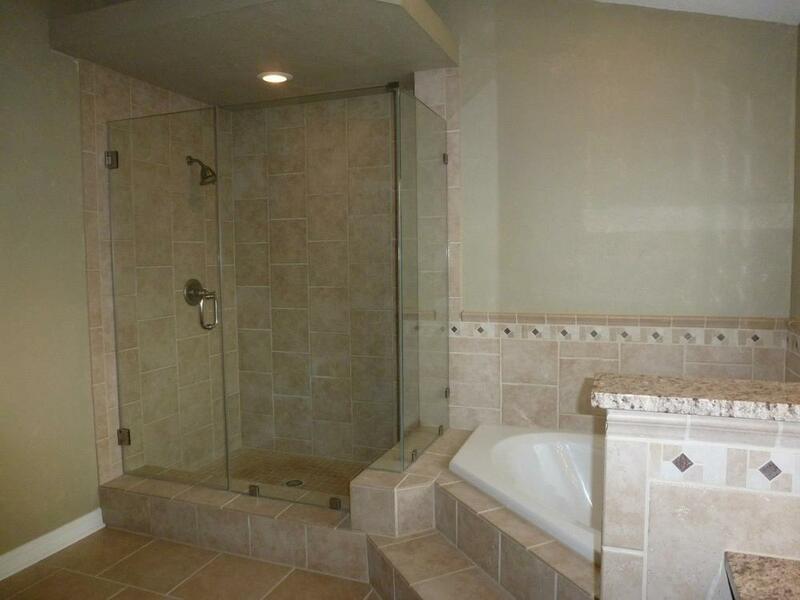 The previous owners of this house must have had one of those moments. It's a little hard to tell from the above images so here's a closeup. Our bedroom walls are a soft taupe, and our room is filled with all neutral pieces. 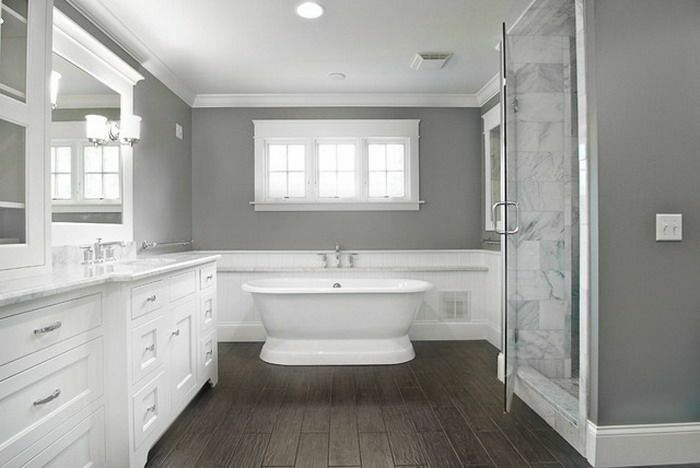 Since our tile is already neutral as well (and there's a lot of it), I'd like to add a little contrast with the paint and go gray. This room if very open and gets a lot of light so going darker is not an issue, especially since a good half of the room is covered in tile anyway. 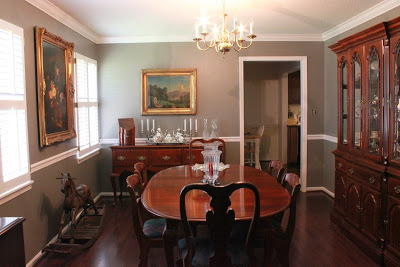 I helped my mom redo her dining room a few years ago and absolutely fell in the love with the gray paint we used on the walls. Just to be sure though, I purchased a sample of it (Mountain Smoke by Valspar) along with another gray to see which I preferred best. Mountain Smoke was the obvious winner. 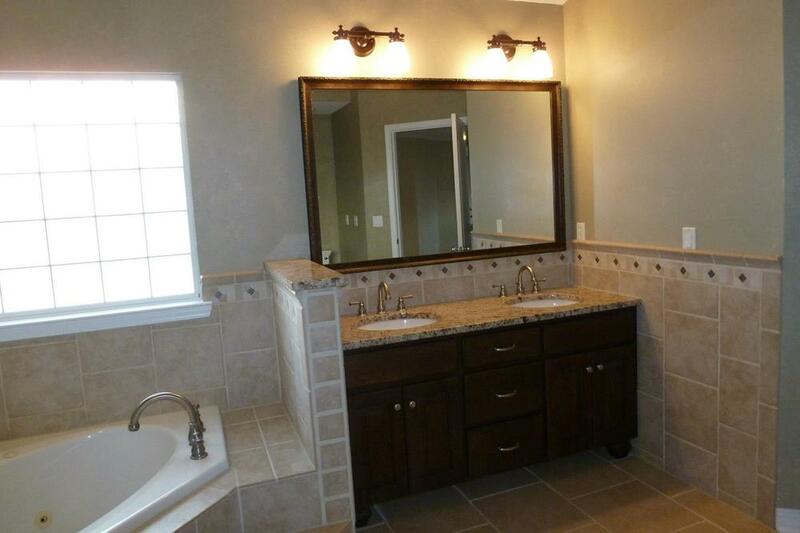 It's a warm gray that will compliment the veins in the existing tile and wood stain on the vanity.